It's the last reader request ink for this week, and then we will move on. Let's take a look at Robert Oster Schwarze Rose. I purchased my bottle of ink from Pen Chalet. This ink is more expensive for a Robert Oster ink-the bottle is only 15ml, and cost $13.50. Schwarze Rose is a dark green with a copper/rose gold shimmer. It's so dark I would maybe call it a green-black. In large swabs there is a ton of shimmer. It looks to be the same shimmer that's used in the De Atramentis Pearlescent Copper inks. Other properties: medium shading, no sheen, and copper shimmer. On Staples 24 lb copy paper there was feathering and just a little bit of bleeding. Ink swabs for comparison, left to right (top to bottom for mobile RSS): Birmingham Gibson Field, Robert Oster Schwarze Rose, and Robert Oster Moss. 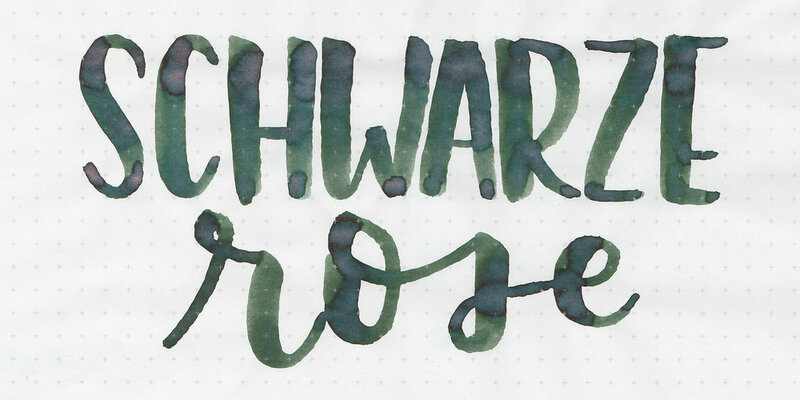 I'm pretty sure Schwarze Rose is the shimmer version of Robert Oster Grun Schwarze, but I don't currently have a sample of that ink so I can't be sure. Sailor Jentle Miruai, Monteverde Jade Noir, and Pelikan Edelstein Olivine. Click here to see the green inks together. I used a Pelikan M400 White Tortoise with a vintage 400N nib. The ink had an average flow, I didn't have any issues with clogging. Overall, it's pretty expensive for how much ink you get. It's well behaved for a shimmer ink, and I like that it uses a different shimmer instead of just gold or silver. Disclaimer: I purchased this ink myself, and all photos and opinions are my own. This page does contain affiliate links, but is not sponsored in any way.